This essay traces the history of one of the first and most important literary groups in Guatemala. 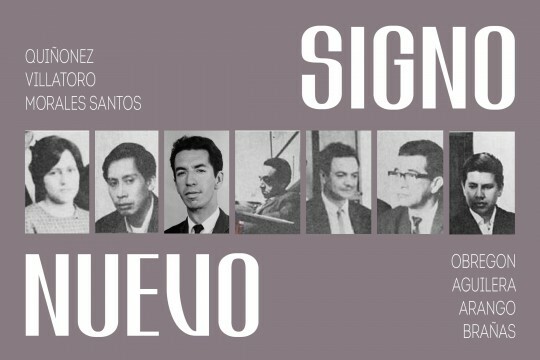 2018 marks the fiftieth anniversary of the formation of Nuevo Signo, arguably the most influential literary group in Guatemala. Formed during a time when the country was ridden by war, writers didn’t have access to publishing houses and artists and political dissidents were targeted continuously to the point that many sought refuge in neighboring countries. The work done by the members of Nuevo Signo was nothing short of monumental. In three years the group funded, edited, and published over ten books of poetry, including a “greatest hits” entitled Las Plumas de la Serpiente (The Serpent’s Feathers) that stirred the local art scene. The group disbanded in 1970, after the disappearance of one of its members, poet Roberto Obregón. Roberto is just one of the many writers disappeared during the internal war (1960—1996). Except for Obregón, Antonio Brañas—who died in 1988—and José Villatoro, all of the other members went on to receive the Miguel Ángel Asturias National Prize in Literature for their life’s work. Last year, Luis Méndez Salinas and Carmen Lucía Alvarado from Catafixia Editorial rereleased Las Plumas de la Serpiente. With a cover designed by Odiseo del Silencio, this new edition of Las Plumas captures the intensity, sensitivity, poetic beauty, commitment, and ferocity of its authors. For this piece, the author spoke with former Nuevo Signo’s editor, Francisco Morales Santos and Luis and Carmen from Catafixia Editorial.